I panicked at the opening pages of Sky Saw (Tyrant Books / Dec. 2012), which are filled with this dense, complicated language, fearing Blake Butler would hold me hostage for the novel’s duration in a swamp of unclarified narrative, a poetic mire that, while beautiful in its bruising, wouldn’t lead me forward through a story. But then Sky Saw opened like the mold-blooms of his previous works, and there was a narrative to wrap my eyes around, and the book held me captive in a completely different way. Ever and There Is No Year worked mostly without names, asking us to observe the generic and omnipresent images of mother or father or child. Sky Saw instead uses named characters – a mother-figure, Person 1180, a father-figure, Person 811, and a child, Person 2030 – yet the names are unkind, allowing us to grip each character only while reminding us that we will never fully overcome the anonymity of these expulsive worlds. “I could go on at what these days were but the truth is I am tired. Would you even believe me if I did? I’ve spent enough years with my face arranged in books. I’ve read enough to crush my sternum. In each of the books are people talking, saying the same thing, their tongues slim and white and speckled with the words. “I don’t want to be here. I want to get older. I want to see my skin go folding over. Blake Butler has an obsession with doors and windows and houses, with noise, with fathers and mothers and children growing within these doors and windows and houses, within this noise. 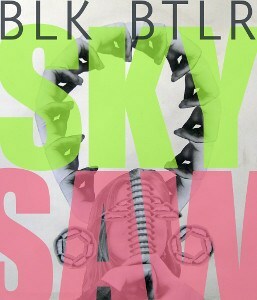 Sky Saw is a new layer of skin, a new house for a mother and father to rot in, another shifting noise for an expanding child, a book as relentless and fiercely mutated as his others, another warping from a mind obsessed with the vacancy of identity, with the loss of living. Sky Saw unnerved me and then reconfirmed my love of Butler’s words, how he makes our own devastatingly torturous world real again by expelling all that we thought we knew of words. J. A. TYLER is the author of Colony Collapse, available now from Lazy Fascist Press. His recent work has appeared in Black Warrior Review, Redivider, Cream City Review, Diagram, Fairy Tale Review, Columbia Poetry Review, and New York Tyrant. He also runs Mud Luscious Press.
. . . nice review!